This is an outstanding READY TO SAIL Sloop. 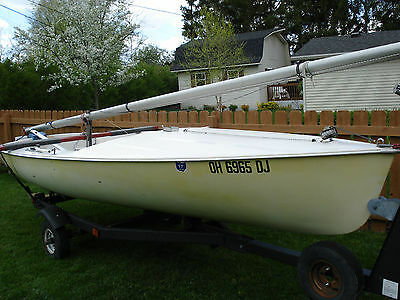 Length 27 Ft , beam 9.2Ft, draft 4.3 Ft. Used in fresh water on Lake Huron and on Lake Erie. There are impressive upgrades and improvements aboard this vessel. A new navy blue bimini was installed new this year and not on the pictures, but comes with boat. The power train consists of a professional factory rebuild on a Westerbeke four cylinder self-bleeding 30 HP Diesel (80 hrs.). Oil changes can be done in less than 15 minutes!. The attached drivetrain is 100% new as of 2014 as follows: Damper plate, Heavy duty adapter plate, Z-transmission, Coupler, Drive Shaft, Dripless seal, Cutlass bearing, Zinc, Engine rails and Mounts. This drive train provides superior maneuverability, smoothness, and quiet operation in any weather conditions and quickly starts in warm or cold temperatures. The rigging is in excellent condition with dual back stays, six shrouds and furling forestay. The aluminum mast features interior lines and floatation, All safety lines are new with heavy duty ¼ in ss cable and fittings. Sails consist of a nearly new 135% furling Genoa (This is a high end QUANTUM SAIL with all the bells and whistles) costing in excess of $2k. This sail is crispy and white complete with Sunbrella sun guard. 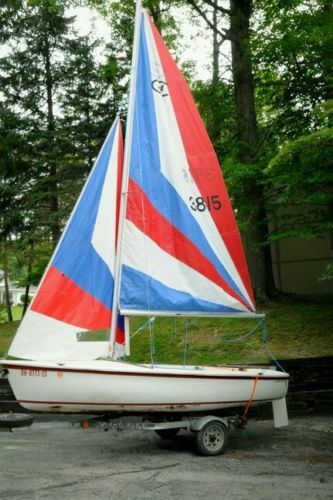 The main is a fully battened Ray Leonard with double slab reefing and is in great shape (no rips or repairs) and comes with a matching Sunbrella sun cover. Lewmar winches in good working order, CSI Flexible Furler, Boomvang, Cunningham, Travel Car for main sheet,CQR 20 pound anchor and 100 feet of rope with short SS chain. 2nd Danforth lunch hook anchor, Simpson Lawrence 600 Electric windlass with capstan and deck mounted foot switches, Standard marine radio, New blue sea systems AC and DC electrical panels and all new wiring throughout, including the mast, new Moore digital sonar depth sounder, Bulkhead mounted compass and speed log. The hull is solid hand laid glass in superior condition with new Groco seacocks. The hull was awlgripped a few years back. Misc: Transom mounted SS swim ladder, solid SS bow cleats, Cabin fan, Halogen and LED interior lights, Custom dinette, New interior Cushions, Cockpit cushions (open cell foam), Electric and manual bilge pumps, plug in shore power and plug in generator wiring, SS fuel tank, Solid Brazilian cherry cabin sole, Map table with storage, Panasonic SS inverter microwave, Butane stove top burner, built in icebox and ice chest, deep sink, New Sealand toilet with new 7 gallon holding tank, and electric pump water flush, two New water storage tanks and all new water hoses and deck fittings for toilet, Hanging closet , V-bunk cabin with locking doors. 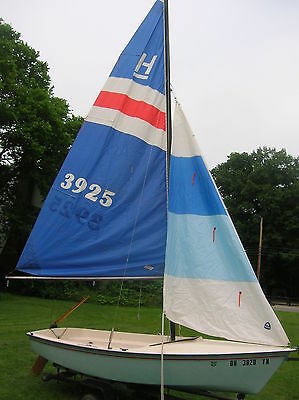 This is a superior sailing boat with a very low center of gravity giving a stable ride without excessive healing. This sailboat is at its best in heavy weather. A great interior (see photos). And some other items not mentioned/pictured here. There is over twenty thousand dollars invested in this fine boat. Clear Ohio title. NOTE! 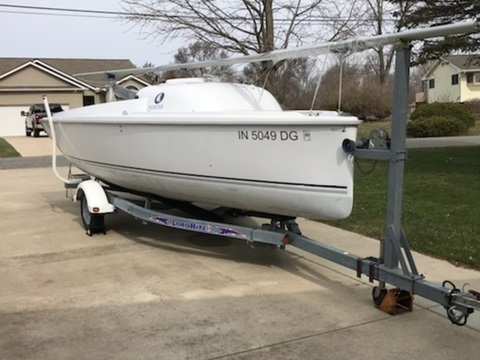 The trailer shown with the boat is NOT part of this auction but is available for purchase (see details below).The trailer is a custom designed trailer and built in an iso certified mfg. facility on a Venture triaxle. 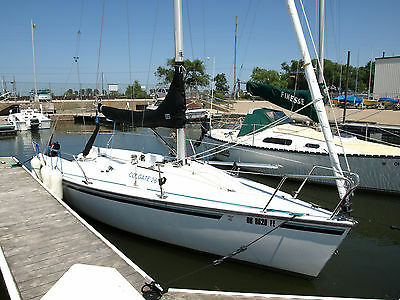 It is unique in that it will transport a wide variety of both sailboats and power boats and can be changed over in under an hour with just a set of standard wrenches. Specs. are as follows; Max boat length power or sail= 32 feet, max payload=13000 lbs. keel depth up to 6 ft. The trailer has truck style heavy duty drum brakes on all three axles. It has a 7 inch high strength beam with 10 guage hot dipped galvanized cross members. 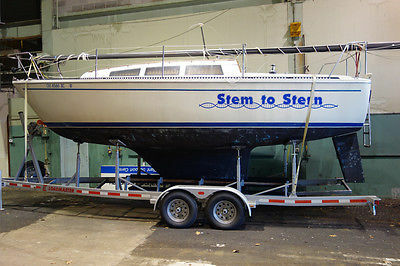 If the winning bidder on the sailboat opts to buy the trailer the price would be 8,000 (firm) and paid for separate from ebay. If not, the trailer will be listed later at 9,000. The trailer has only 3500 miles and would cost 12,500 if you buy it as a new trailer.Shipping will be the responsibility of the buyer.Please see my 500+ all positive feedback, bid with confidence. 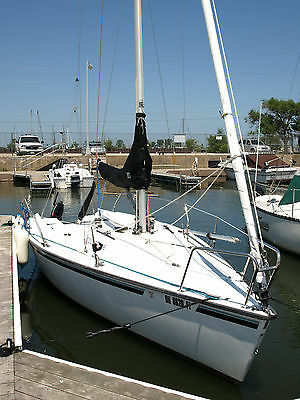 Selling a 1987 Minnesota “Y” 19 ft. Sailboat. She is a dingy style racer built by the White Bear Boat Works of Minnesota. She is complete and in good working condition. She is very simple to rig & easy to sail. Both jib and mainsail are in good condition. We sailed her last fall and the Ohio registration is still good for 3 years. 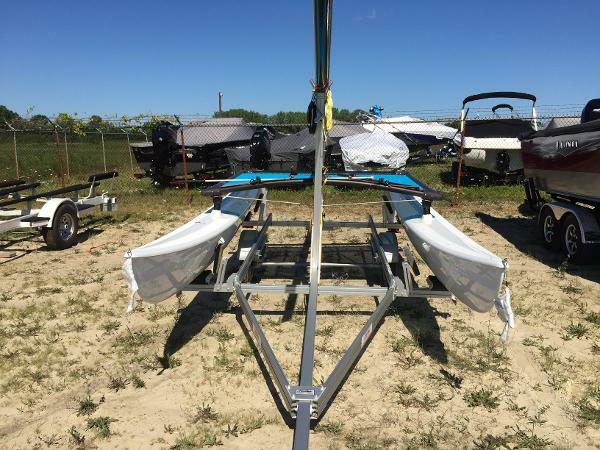 This boat comes with a trailer with 2 inch ball and attached mountings for the mast. Trailer was recently refurbished & repainted. We added an adjustable motor mount on the boat‘s transom for an outboard motor. 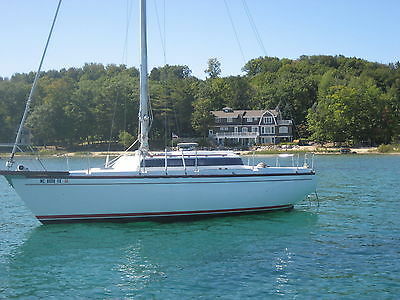 This boat is a super deal and is ready to go sailing! 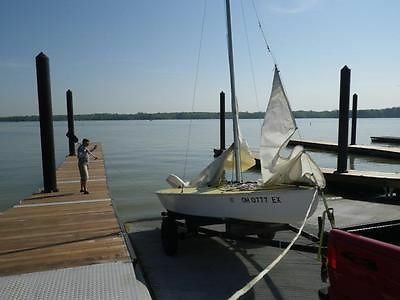 1984 HOBIE CAT 14' HOLDER DAYSAILER SAILBOAT WITH TRAILER.. GOOD SHAPE, MAIN AND JIB SAILS LIKE NEW.. ALL RIGGING HARDWARE LIKE NEW. 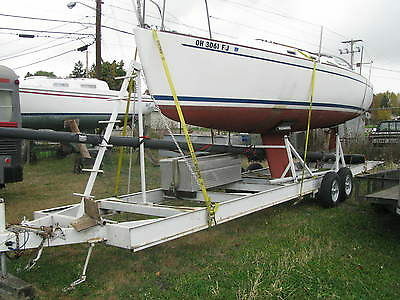 DAGGER BOARD, SWING RUDDER.. ROLCO TRAILER WITH ROLLERS AND NEW TIRES... ACTUAL SIZE OF BOAT IS LESS THAN 14', NO TITLE NEED IT OHIO..1/8" BALL.... 740 803 3667 Bruno Powered by eBay Turbo ListerThe free listing tool. List your items fast and easy and manage your active items.